Freediving UAELatest NewsWhy is the Mediterranean Sea so Clear? 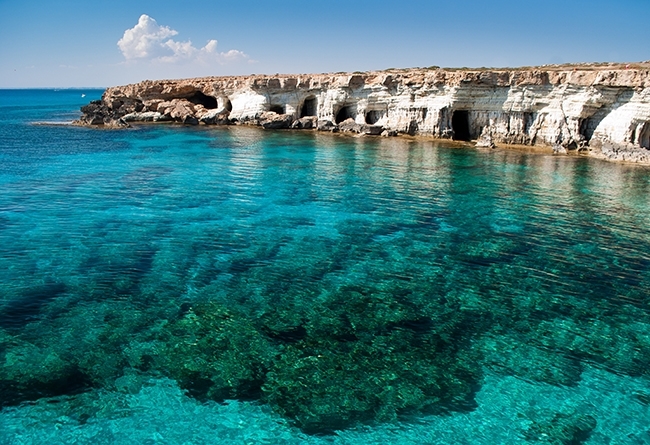 The Mediterranean boasts crystal-clear waters almost all year round. It’s one of the best places to both teach and learn how to scuba dive. Instructors can see into the eyes of their students, even from afar, and know what they are thinking thanks to the astonishing clarity of the water. But why is the med clearer than most other regions of the world? FOOD. Or lack of it thereof. The Mediterranean Sea is practically a closed system. It’s practically a lake if you look at it on the map, landlocked on all sides except for the Strait of Gibraltar under Spain. Here is where the vast majority of water exchange occurs. The Red sea and the Black Sea also feed the Mediterranean with water, via the Suez Canal and the Bosphorus Strait, but this exchange is very, very small. Water exchange is the delivery system of the nutrient supply for the world’s oceans and seas. It is the pizza delivery boy of the water. The mediterranean pizza boy is lazy, just like those in Cyprus. Water is exchanged at the slowest of rates making the med as clear as a swarovski crystal. Limited water exchange = limited food for tiny organisms called phytoplankton aka algae, and it’s these little dudes who play the lead role in water clarity. The Mediterranean is classified as “oligotrophic”. The word ‘oligotrophic’ comes from the Greek words ολίγον (oligon) meaning “little/few”, and τροφή (trophi) meaning “food/nutrition”, so it means “little, or not enough, food”. Phytoplankton need nitrogen and phosphorus in order to grow, in addition to light and carbon dioxide. As we know, light and CO2 are abundant in the Mediterranean sea, but nitrates and ammonia (a form of phosphorus) are in short supply. The water column is also stratified – the top rarely mixes with the bottom due differences in temperature – forming thermoclines. Water is only truly mixed with extreme weather conditions or in areas of upwelling or downwelling caused by a combination of geographical features and ocean and atmospheric circulation. Most nutrients are found in the bottom layers, but algae thrive in the top layers, where the sun shines, as they need light to grow. The result of all these factors is the clear, blue water that all mediterranean divers know and love so well. The only negative side of these conditions is that the fish tend to be smaller, but the waters never turn green and murky. The water is stunningly blue and it’s perfect for taking amazing photos! So jump in and start snapping! For more information about diving in the crystal clear waters of the Mediterranean sea check out our Southern European Vacation Spotlight.